The first T flip-flop design, Design A, is a compact, simple design. To build it, you need 2 sticky pistons, 1 redstone torch, 1 comparator, 1 full caldron, and 1 input — in this case, a button. 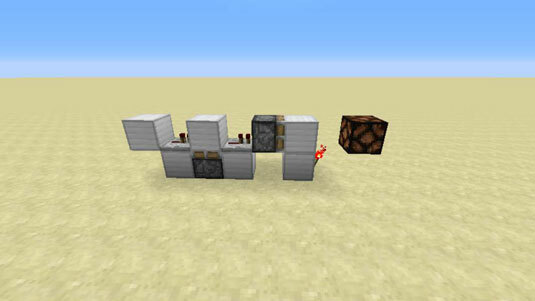 The output is shown by the redstone lamp, which lights when the T flip-flop is activated. Simply build it as shown. When the button is pushed, the sticky pistons pull the cauldron back and down, powering the comparator that then lights the redstone lamp. The lamp continues to stay lit, as though the button were a lever sending continuous power rather than sending the signal only briefly, as a button would normally do. To build Design B, which is silent (doesn’t make any noise) and resource friendly (uses much fewer items to complete), you need 3 droppers, 1 hopper, 1 comparator, 1 item that is not a tool (don’t use items such as swords or hoes), and an input (a button will work for now). Place a dropper in the middle section of the area you’re building it in, facing the dropper toward you. In the example shown, 3 blocks are laid on the bottom — though you can build this contraption directly on the ground. Look down, jump, and place a dropper next to the dropper that you placed. Place a new dropper facing into the dropper you placed in Step 1. On the top of the second dropper you placed, you should see a rectangular opening at the top. If you don’t, repeat this step until the dropper’s opening is at the top. Hold down the Shift key and then right-click to place one more dropper, which should be on top of the last dropper you placed. This final dropper should be 1 block above and facing toward the dropper you already placed. Look down, press the Shift key, jump, and then right-click with the hopper on top of the dropper. Right-click the ground next to the dropper under the hopper to place the comparator. Right-click the dropper you placed in Step 2, and then place a block into its GUI. Place the input (a button, in this case) on the side of the second dropper. The comparator is the output. Put a repeater after the comparator because the comparator on its own gives off only a single redstone signal. To fix this, put more than one item in the dropper. Push the button, creating a pulse, and — voilà! 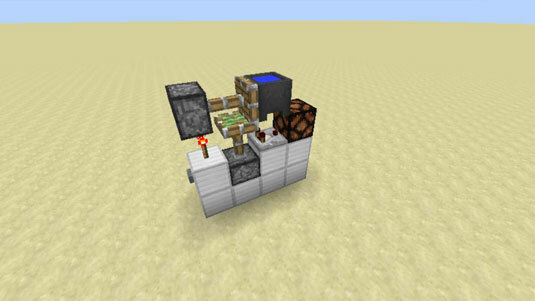 — the contraption powers the redstone lamp. Start out by placing one repeater, as shown. Next to the repeater, mine 1 block down, get into the hole you’ve made, look down, jump, and then right-click to place the sticky piston. You should see that the sticky piston is facing upward. Place a block on the sticky piston, get on top of that block, and right-click the ground next to the block. Get down from the block and move onto the repeater. Continue walking forward until you’re 2 blocks away from the repeater. 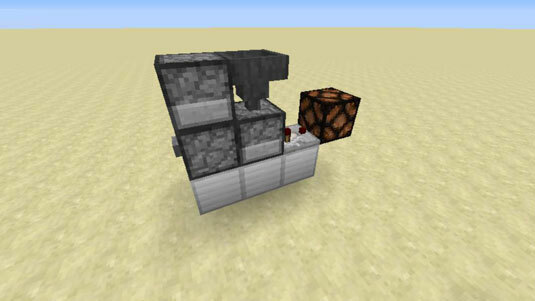 Turn until you face the repeater, and place the second sticky piston next to the repeater. Place the next block on the side of the sticky piston that has green on it. Next to the block, mine 1 block down and place the redstone torch in that hole. Place an input, such as a button, on the first block (not visible in the figure). You have finished Design C. The output is directly after the hole with the redstone torch in it. (Refer to the redstone lamp shown.) Bravo! You have mastered the T flip-flop!